The skills that I have learned from ProDoula have changed me. They have changed me as a person, as a wife, as a doula, as a colleague, and as an entrepreneur. To be honest with you, I am very business minded. I care greatly about systems, search engine optimization, creating jobs for other women, and increasing the amount of money my team and I go home with. My clients, and my passion for them? My clients are happier and staying with Houston Central Doulas long-term. My passion for them has never wavered. ProDoula taught me how to build a community for my clients. ProDoula taught me how to truly listen to what my clients desire, and to build systems that get them what they need, when they need it. We all know that a passion for your work is exciting. It’s almost a high. There’s a lot of ideas. A lot of good intentions. But there’s little value in an idea that is never executed and made manifest. It doesn’t matter how passionate you are about providing stellar services to your clients if you don’t build a way to reach them. When your business catches fire (and it will), you need to know that you can always give 110% to every client. That’s impossible if you’re burnt out because you don’t even have time to do your laundry. Or multiple clients need you at one time. Or you’re losing money because you want to be everything to everyone all the time. ProDoula taught me how to build a battleship. A battleship that guarantees to my client that Houston Central Doulas has them through their entire pregnancy, birth, postpartum recovery, and the start of their parenting journey. It guarantees that all of my clients get extensive and authentic support from the second they first call or inquire. They don’t just get a service. They get an experience! The biggest thing that I learned from ProDoula, the thing that really made the difference, is offering bias-free support to every family. It’s normal for us to get into birth work (and all of the services that follow) due to our own experience. Whether that experience is good or bad. ProDoula taught me how to respect myself while respecting the client. When I am with a client, Moriah Burke steps back. My opinions don’t matter. All that matters is being everything that the client wants. Passion is good. I have passion. But sometimes the client doesn’t want passion. The client wants a professional. A level-headed professional who is qualified and knows what to do. ProDoula taught me consistency. Consistency with my clients. They’re not going to pay me money for a birth and then only see or hear from me at the birth. Consistency with my brand. That little pram is cute and classy. I need to keep working it. Consistency with my administrator role. Someone needs to keep up with the social media marketing. The clients want to find us. It’s easy to get burn out even when your number of clients is low. But if you are blogging and building, that’s still working. Consistency with the women behind the scenes in my brand. We’re going to have team meetings. I’m going to look them in the eye and know who they really are outside of members of the brand I’ve created. I’m going to sit at table meetings for hours on end to see who they really are as women. And I’m going to connect the clients with the women that are going to make them feel safe and confident and loved. Yes, loved. You can own a business and have a battleship, and still connect emotionally with your clients, and with your team. ProDoula gave me life-long friends. ProDoula helped me learn more about forgiveness and compassion for my family, my friends, and my colleagues. 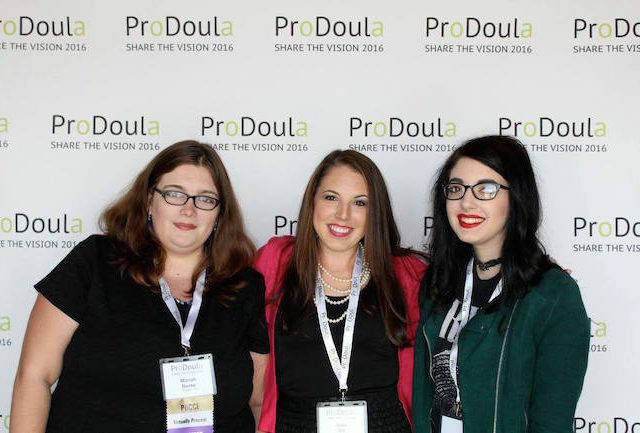 ProDoula was the only one of the many organizations I trained through who got me through burn out (approximately eight times). ProDoula is the team of people who cheer me on when things are going well. ProDoula has taken me from a fiery blaze of free doula-wearing Iron Maiden band T-shirts to work, to a slow and steady fire of dress pants and a five-figure income. From Google page 14, to Google page 2. From looking down on myself all the time, to someone who is not afraid to shine. I went from major introvert to the internet personality on Facebook many of you know and love. And, most recently, ProDoula has taught me to fly my flag without looking around me in fear.